Today we are blessed with two extraordinarily successful theories of physics. The first is Albert Einstein's general theory of relativity, which describes the large-scale behaviour of matter in a curved spacetime. This theory is the basis for the standard model of big bang cosmology. The discovery of gravitational waves at the LIGO observatory in the US (and then Virgo, in Italy) is only the most recent of this theory's many triumphs.The second is quantum mechanics. This theory describes the properties and behaviour of matter and radiation at their smallest scales. It is the basis for the standard model of particle physics, which builds up all the visible constituents of the universe out of collections of quarks, electrons and force-carrying particles such as photons. The discovery of the Higgs boson at CERN in Geneva is only the most recent of this theory's many triumphs.But, while they are both highly successful, these two structures leave a lot of important questions unanswered. They are also based on two different interpretations of space and time, and are therefore fundamentally incompatible. We have two descriptions but, as far as we know, we've only ever had one universe. What we need is a quantum theory of gravity.Approaches to formulating such a theory have primarily followed two paths. One leads to String Theory, which has for long been fashionable, and about which much has been written. But String Theory has become mired in problems. In this book, Jim Baggott describes ": an approach which takes relativity as its starting point, and leads to a structure called Loop Quantum Gravity. Baggott tells the story through the careers and pioneering work of two of the theory'smost prominent contributors, Lee Smolin and Carlo Rovelli. 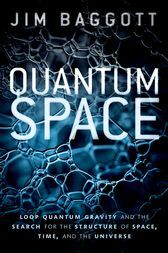 Combining clear discussions of both quantum theory and general relativity, this book offers one of the first efforts to explain the new quantum theory of space and time. The discovery and development of Loop Quantum Gravity has been a great adventure. Jim's story beautifully captures its insights and excitement.